We’ve all had ideas that sounded great at the time, only to have a “what the hell was I thinking?” moment somewhere down the line. Usually, these types of things involve deep-fried bacon-wrapped bacon, or a novel new use for the claw end of a hammer—and as such they only end up with either some mild embarrassment or a short trip to urgent care. Colgate is a company that has done one thing very well for a very long time: make toothpaste. Since toothpaste is technically something that goes in your mouth, somebody had the bright idea that Colgate should branch out into other things that also go in your mouth—such as food. The result was Colgate-brand Kitchen Entrees, cheap microwave dinners with the Colgate brand slapped on the front. Remarkably, people did not line up in droves to buy TV dinners from the maker of their oral hygiene products—in much the same way that people likely would not warm to soft drinks made by Listerine. So ill-conceived was this product that in the short time it was available, its very existence managed to drive down sales of Colgate’s toothpaste—making this perhaps the least effective branching-out ever attempted by any company in history. It’s easy to see how this could look good on paper. People get fat because they don’t exercise enough, and because they eat too much. The simple solution: make them exercise while they’re eating! But how? 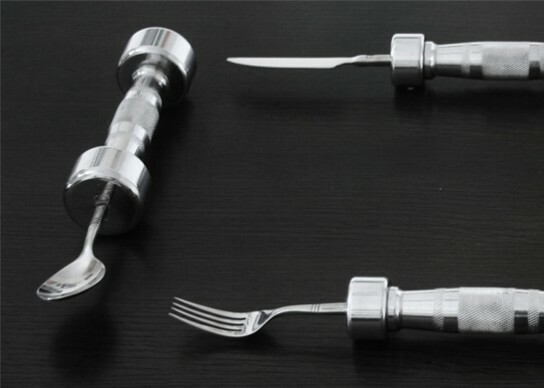 Why, with weighted dumbbells for utensils of course! Okay, so maybe it didn’t even look that good on paper, either. Apparently these are actually still available on the Internet, under the name “Knife and Fork Lift,” which is just . . . we just don’t have any comment on that. The knife and fork weigh one kilogram each, while the dessert fork weighs twice that—because, as we all know, desserts are more fattening. So you can burn more calories with the heavier spoon while eating your fattening dessert. We’re trying to picture someone making this business pitch to a loan officer with a straight face—and it is not working. These things are marketed as a “gift” for dieters, but unlike most gifts they cost $160 for the complete set. We had to do a lot of checking to make sure this wasn’t some kind of weird photoshop-based prank—but no, the Egg Cuber is a product that really exists. It doesn’t cut the eggs into a cube; it molds them into a cube, producing a hard-boiled egg straight from your nightmares. On the surface, this seems harmless enough—but we would no sooner go near a square egg than we would choose to munch on a square apple. Just looking at the picture makes us feel a little funny, because this shape seems like a really obvious way to broadcast that this thing is not natural and should not be eaten, or even looked at for too long. The strange thing about these, aside from the fact that the people modeling them on the box do not appear to be doing so at gunpoint, is that the image doesn’t immediately seem to match up with its description. 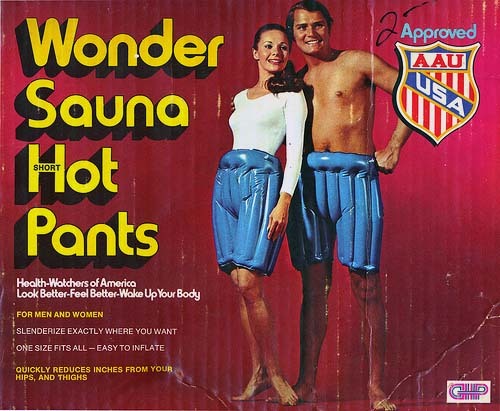 We’re not sure what we would expect something called “Wonder Sauna Hot Pants” to look like, but it sure as hell would not be this. For one thing, “Hot Pants” means something else, and this meaning was well-known by the 1970s, when it is obvious from the picture that this product existed. And we would not expect a “Wonder Sauna” of any sort to have anything to do with short shorts—or garments of any kind, really. Are the pants actually hot? Don’t saunas usually have burning coals in them? We’ll refrain from asking the next logical question. Apparently these were meant to “help” gullible people who hoped to slim down through some unexplained process. But we’d hazard a guess that the only thing this product ever helped anyone do is be mistaken for a flotation device. The CueCat, released in 1999, was a stylized, glorified barcode scanner that connected to your PC. Its purpose was to scan little barcodes, or “cues,” which would direct your web browser to a URL. The fact that you’d have to be reading a magazine in front of your PC to have a use for one was the least of its problems. Amazingly, this product gained the confidence of several very big-name investors, such as Coca-Cola and Radio Shack, to the tune of 185 million dollars in investments. The barcodes even showed up in Forbes and Wired magazines for about a year. And all it ever did was address a non-existent need, being “unnatural and ridiculous” to use according to tech critics. It assumed that people would want to make their print magazines interact with their computers, which is ludicrous. On top of all this, in September 2000 the company’s website experienced a security breach whereby CueCat users’ private data was compromised, which had in fact long been a concern. The product has variously been called one of the worst tech products of its decade, or even of all time. One of the more nonsensical products in the crowded nonsensical field that is late-night infomercials, Perfect Pancake offers an unbelievably simple solution for those who have a hard time flipping pancakes: flip the whole damn griddle. It’s essentially two griddles stuck together with a handle. Of course, it’s pretty tough to check on how your pancakes are coming along, since they’re closed up inside this clamshell thing. So you could be in for a surprise when you open it up: maybe you left them in a little too long, and the batter is baked to the inside of the stupid thing like ceramic. Or maybe they’re undercooked, leaving you with a plate full of gooey crap. Maybe flipping pancakes with a spatula . . . just isn’t that hard. Do you know what cigarette smokers like about smoking? It’s the smoke. They like inhaling the smoke and holding it in their lungs—and that is, in fact, why it’s called smoking. And smoking isn’t good for you, but trying to mitigate the risk by producing a smokeless cigarette is like trying to avoid gun injuries by producing a gun which can’t be loaded with bullets. Things went very wrong with this product from the get-go: users in test markets complained that it was difficult to use and tasted like crap, and the company’s projection that smokers would acquire a taste after a few packs didn’t pan out—most people tried one and gave the rest of the pack away. The “smokes,” manufactured by RJ Reynolds, worked by heating and aerosolizing tobacco flavoring—and although they didn’t work too well for delivering tobacco flavor, they did work pretty well for delivering crack. They were found by crack users to be a cheap and easy way of modifying their stuff. This quickly-discovered fact only hastened their demise from the market: they lasted for less than a year. The problems with this idea should become obvious after about ten seconds of cursory thought on the subject. For one thing, people obviously don’t maintain the same position for hours on end while reading in bed. What if we want to lie on our backs for a while? Do we switch to a standard version of the same book? Or hold the sideways book a little differently—which leaves us with the very “problem” you were trying to remedy in the first place? And, most importantly, what if we want to read a chapter or two while we’re not even in bed? Also, it’s not like they make all the books in this format, is it? Indeed, the website lists a handful of titles, none written a day more recently than eighty or ninety years ago. So perhaps for a few very special people who always lie in the same position every night, who want to read the same handful of “classic” books over and over again, and who have never heard of a Kindle, this might be a pretty good solution. Once again, we feel the need to make the point that this is an actual product: it really exists. It is not something one of our editors Photoshopped for a joke. The “Kush Support” is a breast separator—another well-intentioned but rather odd solution to an imagined “problem.” It’s designed to prevent the large breasts of large-breasted women from resting atop one another while the owner is sleeping on her side—which we honestly had never realized was an issue. We suppose that there is no possible shape for a breast separator which is not reminiscent of . . . well, we’re all thinking the same thing. But apparently this isn’t a gag product—just another product of highly questionable necessity. You may be surprised that this is the only Ronco product on the list, but a lot of their stuff could at least be somewhat useful to some conceivable segment of society. We’re not sure how this product has enjoyed such a long run—that’s to say, we don’t know who the hell is buying toupees in spray cans—but here we are. The product is technically called GLH, or Good Looking Hair, but it’s been known colloquially since its introduction in the 1970s as Spray-On Hair. It is exactly what it sounds like: a spray can which can cover your bald spot. It’s still available online today, though even the earliest commercials were less than convincing (as you can see from the photo above), and the entire premise sounds more like a Saturday Night Live commercial parody than anything else. While the rest of the products on this list at least partially fulfill a (somewhat misguided) promise, Spray-On Hair seems to achieve the opposite of what it promises. Spray-painting fake hair onto your head will call more attention to your bald head than simple baldness would have done in the first place. Mike Floorwalker blogs, Tweets, writes, edits and occasionally sleeps.